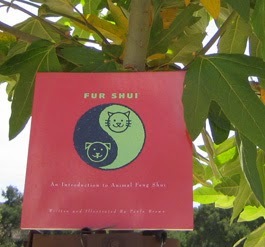 It is true, Fur Shui loves to hang around in nature. So do I! A recent visit to the Irvine Ranch Conservancy found us going on a "Trip to Nowhere" in Limestone Canyon...being a trail guide for others to discover more remote and beautiful scenes. Lots of folks who do photography as a career come on these journeys. The color of career seems to be reflected in their gear being all done up in black. Perfect for boosting their results and life path in a creative manner. Use some black color and jazz up your entrance way with some "motion" or items that move or flow and get those career vibes activated. At home with moving throughout the countryside with cameras and equipment with the color black...these photographers are natural feng shui masters for their own career benefit!